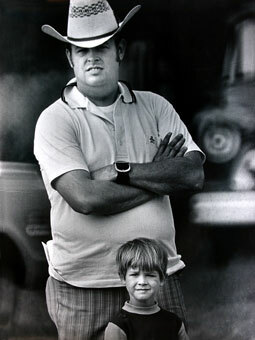 Father towers over his son at the Lancaster Fair in New Hampshire. They are watching the egg toss from the sidelines. His carefully creased cowboy hat, and his crossed-arms posture sends a signal to others not to mess with him. He’s not open or inviting to others. But his son doesn’t even need to look up, just knows he’s there. The heat of his father’s presence warms him. He’s got the biggest security blanket in the world standing behind him and nothing at the fair threatens him, even though he barely reaches his dad’s belt.